The following guest post is an interview with Philip Treacy, orchid enthusiast and the creator of a very unique and beautiful hat collection made out of real orchids! Ryan: Do you often use orchids in your work? How did you get inspired to design these incredible hats? Philip: When the Art of Life approached me, I immediately answered positively. Orchids are my favourite flower and they are often a source of inspiration for my collections. 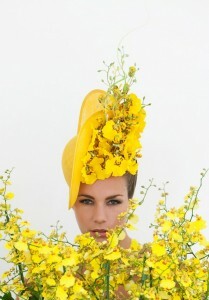 For inspiration for the new hats, I invited the cultivators and their orchids into my studio. I was overwhelmed by their diversity of colours, shapes and patterns. Ryan: Why did you select three different orchids for your collection? Philip: I was initially intending to design one hat, but I found that it did not reflect the beautiful variations of the orchid. Because of this, I decided to design three hats, based on the three orchids that grabbed me the most. The white Phalaenopsis, through its simple and elegant blossoms in combination with its radiant white colour. The blue Vanda, because it is one of the most striking orchids and in my opinion, it is one of the most evolved. And the yellow Oncidium, which is known as the ‘dancing orchid’, because some of its flowers resemble dancing dolls and some of its flowers look like a shower of gold. Each orchid has its own unique character and they truly inspired me. The photos and interview are courtesy of Art of Life https://www.facebook.com/orchidsinfo. Legendary milliner Philip Treacy, whose hats have been worn by royals and celebrities around the world, has designed a hat collection inspired and created by orchids. The one-off collection is a collaboration between the fashion designer and Netherlands-based Art of Life. Check out the Facebook page https://www.facebook.com/orchidsinfo to see where his collection is featured.